When the school year begins to draw to a close, many educators seek field day ideas for elementary schools. Kids are naturally antsy at the end of the school year, and who wouldn't be? Having a field day allows them to go outside, have some fun and run off their natural energy. 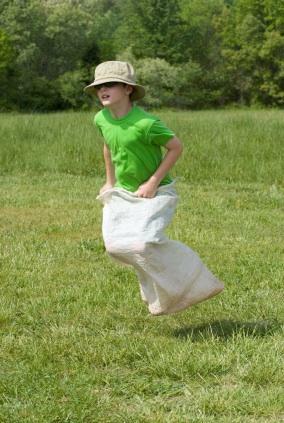 Field day is a time honored tradition in elementary schools. The best field days combine the excitement of the end of the school year, a beautiful spring day and rambunctious elementary school kids. Most often, field days in elementary schools consist of a number of competitive sporting events in which kids can participate consisting of activities like relay races and games. In recent years, however, many have criticized field days as being too competitive in a way that can damage a child's self-esteem. Not all students have natural athletic ability or an interest in competitive sports and games. That's why having a wide variety of field day ideas for elementary schools can help to make field days fun, active, inclusive and positive experiences for all who participate. When planning a field day for elementary students, the key is variety. If you can provide a wide range of activities, then all the students are likely to find events that interest them. Traditional field day games like three-legged races, gunny sack races and Frisbee golf all have a place in a well-planned field day; however, including some less traditional field day activities can help make the event enjoyable for every student and not just those who excel at sports. Games can provide an opportunity for the kids who aren't quite as quick or strong as the natural athletes, to excel. Many of these games rely on aim and precision rather than raw athletic ability, and yet they can be a great source of fun for elementary students. Best of all, in many cases the games can be taken indoors. Games that can be played either outdoors or indoors offer a great advantage if field day just happens to be scheduled on a rainy day. A bean bag toss is easy to set up and easy to play. All you need are hula hoops for targets and bean bags for projectiles. Create a throw line, have the children stand behind it and toss the bean bag at the hoop. Rubber ball bowling is another game that takes just a little set up. You will need several medium-sized rubber balls and about 20 to 30 "bowling pins," which can be made out of two-liter soda bottles filled with a little bit of sand. Create a start line and set up all of the pins. Give each child three tries to see how many of the pins she can knock down. A ping pong ball blow is another fun game that can be used for field day. Set up a "track" on a hard surface like a picnic table and mark lanes of about a foot wide on the surface, as well as a start and finish line. Give each student a ping pong ball and a straw. At the starting signal, the students use the straws to blow their ping pong balls from the starting point to the finish line. Create a fishing hole of paper fish and let the students "catch" as many of the fish as they can. To set up the game, you will need a large plastic pool, several paper fish, paper clips, tape, small round magnets, string and sticks to use as fishing poles. Tape a paper clip to each of the paper fish and put them in the pool. Set up the fishing poles with a small round magnet on the end of the string. Have students stand around the pool and fish for a predetermined amount of time, trying to catch as many of the fish as they possibly can. These are just a few of the many field day ideas for elementary schools. With a little imagination, you can create a fun and entertaining day for everyone who participates.